This is my favorite picture of the week! Armed with a SGD28 voucher given to me by a colleague, my lunch kaki and I eagerly trooped to Spring Court for lunch, hoping to a good meal at great value. Spring Court is located in its own private enclave in Far East Square and resembles a Chinese Pavilion complete with a courtyard, wooden interiors and sporadic bamboo plants. The first warning bell sounded when my kaki and I realised we were the only ones occupying the whole restaurant. The staff were over enthusiastic but generally charming so we decided to go ahead and give the place a shot. Mixed vege platter comprising black fungus, water chestnut, some crunchy turnips, carrots and asparagus. Everything looked so white, starchy and healthy. My kaki enjoyed this dish but i couldn't take it half way and had to use the soy sauce dip. Hing Hwa Beehoon with seafood. This is supposed to be one of their specialities but I found the taste lacking. Even my mom can cook better! Hing Hwa Beehoon is supposed to be thin, fine and melt in the mouth (somewhat like dragon beard candy) but this one was coarse and uninteresting. The accompanying "special" sauce failed to excite my tastebuds. For the best Hing Hwa Beehoon, my vote goes to Pu Tien. Fermented wine pork pieces. I enjoyed this dish the best. Nuggets of battered pork pieces enveloped in a saltish red marinade. Somewhat like sweet and sour pork. Delicious. The portion was also quite generous. Vegetable based dim sum. This is supposedly a "daily chef special". There were four pockets in each dim sum, containing a different shredded vegetable. I could only make out carrot and turnip. The flavors did not harmonise well together and tasted bland. My kaki and I both did not like it. Orh-Nee (yam paste). The orh-nee didn't come in a mashed up dollop like other restaurants serve it. This one came with a cutesy spiral "ice cream" top. The taste was just right with only a hint of sweetness. I found the texture a little too dry but my kaki liked it and finished her whole bowl. Muah chee balls coated with peanuts. This tasted exactly how I expected it to taste. Gooey, sweet and satisfying with the right amount of bite. Yum. The bill came up to about SGD60 for 2 of us. After factoring in the SGD28 voucher, we paid SGD30 which was okay-value considering we had the whole restaurant to ourselves. Would I come back again? Without the voucher, probably not. There are better lunch deals out there. I'm still in half a mind whether or not to celebrate it. Afterall, I'm not a Triple R person (Reduce Reuse Recycle). But neither am I a super consumer with lots of trash. As early as a month ago, we've been blitzed with all kinds of advertisements telling us to switch off our lights for an hour from 830-930pm today. A booth was even set up beside my office reception to spread the word. Unfortunately, also up for sale were the cutest soft toy pandas (mascot of World Wildlife Federation) which I couldn't resist buying. I am now SGD20 poorer and a proud owner of a panda bear soft toy. Times are bad but that shouldn't stop us from a little humour at the workplace! a. The cups on the two vending machines are to be recycled. Annabelle has already sterilised them. b. Sabbatical leave: Executives booked for New York will now go to Kukup in Johor Bahru instead. Senior executives can go further - up to Yong Peng. c. Our chalet lease in Pulau Ubin has ended. However, as the management takes a keen interest in staff welfare, we have arranged with Francis (from Admin Dept) to rent out one of his rooms at Blk 923, Pasir Ris Drive . His flat was chosen for its proximity to the sea and you can still see Ubin from the window. d. Entertainment claims: Staff will be required to go for a 30-min demonstration by Raj from Finance Dept, who will show you how to withdraw your credit card slowly from your wallet (58 secs), so that others at a business lunch will inadvertently beat you to it when the bill comes. e. The Valentine's Day white chocolates (Deluxeur) which I gave out in January : Those of you who have yet to open the box, please return them expiry date: Dec 2009). f. Monthly Best Employee Award : The $1000 cash award will now be replaced by a box of Deluxeur white chocolates. g. Anual Best Employee Award : The 14-day Disneyland/Hawaii tour and solid gold Rolex Oyster watch will be replaced by TWO boxes of Deluxeur white chocolates. h. Medical: The Oxfordshire-Hopkins Medical Group will no more be on our panel. Annabelle will give you the address of Hong Tong Hong Medical Hall in Sungei Road . Bring you company pass for a 10% discount. i. Country Club Memberships : Senior executives must return their membership cards to Annabelle, who will then register your name with Bishan Community Centre. j. Transport Allowance : No reduction of rate! However, it will be paid on alternate months. k. Gifts for clients: New choices. The Bohemian Crystal list will be replaced by the one from 7-eleven. l. Annual Dinner & Dance : No change (March 20, yay! ), but the venue is switched from The Ritz-Carlton to the void deck of Annabelle's flat in Ang Mo Kio Avenue 10.
m. Bonus : This time, staff welfare comes first! Instead of the usual amount, we raised it up to $2 million. Each employee will be given a Singapore Sweep ticket. The draw is on March 5. I know women who are great drivers but being the hopeless driver that I am, I can't help but identify with this clip! Armed with a ravenous apetite on a sunny weekday afternoon, my colleague decided to venture a little further for lunch and visit this new joint called Skinny Pizza at Suntec City. I have heard of this place for quite some time. Its run by the folks at STRIP who provide waxing services. (brazilian wax anyone ?) STRIP runs really weird ads...you might have seen the one with hairy orang utans jumping into the water. Skinny Pizza is quite near Balaclava and relatively easy to spot once you walk into the main entrance of Suntec City. The setting is casual yet eclectic with bohemian jazz playing in the background. My colleague and I chose a cosy corner alongside the wall with huge cushy armchairs and ordered the set lunch for 2, which, at 32 bucks gets us 2 non alcoholic drinks, 1 skinny plizza, 1 truffle fries and 2 soups. 1) Drinks- Passable...fizzy sodas which come in a variety of flavors. I chose root beer while my colleague chose a citrus flavor. i think hers was nicer. 2) Soup- We both chose the truffle mushroom soup. Strangely, my colleague found hers too salty whereas I found mine rather bland. It was nonetheless a hearty starter. 4) Pizza- The supposed "star" turned out OK only. It didn't blow me away but at least it tasted exactly how it looked- a giant papadum smothered with atas toppings. The choice of toppings is actually pretty extensive (and exotic...anyone keen on ratoutuille topping?) Being the boring people that we are, my colleague and I opted for a relatively safe option of macademia nut with roasted pumpkin. 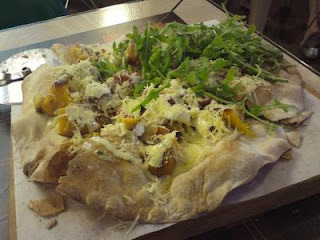 I enjoyed the combination of sundried tomatoes, cheese, macademia nuts and rocket leaves and roasted pumpkin. However, after awhile, it got really messy and I gave up eating altogether. Looks yummy doesn't it? Well, eating is believing! fancy a gym workout for your jaw? want to lose some fats on your face to celebrate cny? visit skinny pizza if so. after being beaten flat by votes, i found myself very reluctantly at skinny pizza- spa esprit's latest 'slaughter-house' for hungry people like me. having had very bad experiences at HOUSE, i have been resolute enough to not let them earn a single cent from me. but i suppose, i can't fight the forces so i must follow and burn some money, at times. arriving at skinny pizza, it was delightful to find a dj spinning some nice tunes but of course a friendly word of advice from your not so friendly neighborhood girl, don't sit too near the console less you want to be deaf earlier. after sharing some hearsay and scrutinizing of the menu, between 3 friends and myself, we ordered 3 pizzas, you know to reward ourselves after a hard day of slavery in the office. so we waited for abit and when the food was finally served, some of us rubbed hands with glee and some not. (mostly me really). the pizza looked like a messy bunch of something. nonetheless, as i sank my teeth into the wild truffled mushroom 'pizza', my heart was bursting with an obscene amount of knns or for the more cultured, omgwtf. such mixed feelings really, the mushrooms were great they even tasted like really musky and raw, almost felt as though they just plucked it from the soil. but, that crust. is this really 'pizza' or PAPADUM? so i munched and i munched and i munched. it was crispy, it was crunchy, it even tasted a lil oily at some point, not too sure if it was my imagination after munching for a long time, but yes, it was hell lot of munching. to the point that the girls at the table had to rest for abit in between to give our jaws a break. nonetheless, after all the pizzas (salami & pesto- normal normal, spinach & egg- tamade expensive!) have finally arrived, i can safely conclude that we were really eating INDIAN PAPADUMS WITH EXPENSIVE ANGMOH TOPPINGS. once again, i've been defeated by spa-esprit and its evil group of establishments. skinny pizza, this is my fond farewell to you for i must be on crack to wanna come back again. however, all is not lost for any of you foodies out there who are keen to lose some weight around your jaw area, you may by all means visit skinny pizza- the right place to meet your needs. Is it possible for Singapore to eat its way out of a recession? With all these super attractive dining deals going around now, I think it is definitely possible! Exquisite Oriental dining at an elusive location! 7 course set dinner now starts from only 48+++ per pax. Menu includes Xiang xu duck (deep fried duck on top of glutinous rice), tomatoes in wasabi sesame sauce (my favorite! ), zhejiang ribs, pregnant woman rice and other delectable yummies. Choose between a salad or mushroom soup, or mango pudding for dessert. Mains include Australian Sirloin Steak and Kurobuta Tenderloin. Buffet lunch at 27+++ (usual 48+++) on weekdays running from 9-16Mar09. Promotion is part of the hotel's 4th anniversary. Buffet dinner is going at 68+++ (usual 88+++) but lunch sounds like a much better deal IMHO.